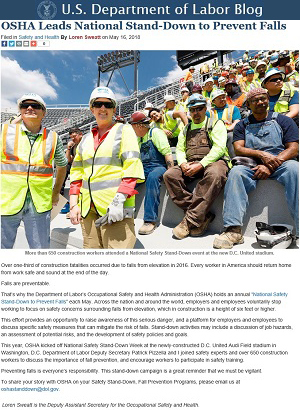 OSHA has proposed a rule to increase the safety of America’s construction sites. The proposal clarifies crane operator certification requirements and reinstates the employer duty to ensure that a crane operator is qualified to safely operate equipment. Comments must be submitted by June 20. For details, read the news release. OSHA issued a proposed rule to extend the compliance date for certain ancillary requirements of the general industry beryllium standard to Dec. 12, 2018. OSHA’s Proposal would not extend the compliance date for permissible exposure limits, exposure assessment, respiratory protection, medical surveillance, or medical removal protection provisions, or for any provisions for which the standard already establishes compliance dates in 2019 and 2020. This limited extension applies to all processes, operations, or areas where workers may be exposed to materials containing beryllium that fall under the scope of the general industry standard. The public may participate in this rulemaking by submitting comments during the 30-day comment period. Read the Federal Register notice for information on submitting comments on the proposed rule. General industry and maritime employers must comply with OSHA’s silica standard by June 23, except for phase-in dates for medical surveillance and for engineering controls in the oil and gas industry. Visit the silica webpage for guidance on complying with the standard, as well as information on silica sampling and analysis, health effects of silica exposure, and answers to frequently asked questions. Woody’s Trucking, LLC and Donald E. Wood Jr. were convicted on criminal charges including conspiracy, wire fraud, mail fraud, and obstruction of justice stemming from a 2012 explosion at an oil and gas processing facility in Wibaux, Mont., that seriously injured three workers. Criminal charges were upheld against the defendants for making false statements to OSHA inspectors in an effort to conceal that flammable natural gas condensate being transported by truck was deliberately misidentified as a nonhazardous material. Testimony provided by OSHA inspectors and scientists during the trial played an important role in securing convictions on 13 of 14 felony charges. The Department of Transportation and Environmental Protection Agency also participated in the investigation. For more information, read the Department of Justice news release. OSHA cited Verla International, LTD for failing to protect its employees from dangerous chemicals and other hazards. OSHA investigated the cosmetics manufacturer in November after an employee was fatally injured in a fire. The company was cited for 11 violations, including exposing workers to fall and compressed air hazards, and for failing to ensure proper conditions to prevent flammable vapors from igniting. For more information, read the news release. All Power Construction Corp. and staffing agency Labor Finders of Tennessee, Inc. were cited following a fatal injury in a Huntsville, Ala., trench collapse. 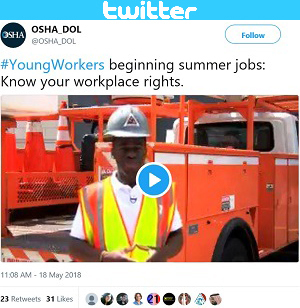 OSHA cited the construction company for lack of cave-in protection, and the staffing agency received citations for failing to properly train employees. Proposed penalties total $152,618. Read the news release for more information. Utility company Douglas N. Higgins, Inc. was fined $162,596 after an employee was fatally injured when a steel plate fell on him. OSHA issued citations for multiple trenching violations, failing to perform atmospheric testing, and allowing employees to use defective equipment to hoist a compactor. The company was cited for a similar violation in January after three employees succumbed to toxic gases while working in a manhole. For more information, read the news release. C&D Technologies, Inc. was cited for repeated and serious violations for exposing workers to airborne lead at levels 11 times the permissible exposure limit. Violations included failure to; prevent exposure to lead, implement an effective lead management program, monitor ventilation for the presence of lead, provide respiratory protection, and install machine guarding. 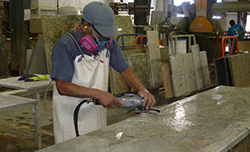 OSHA proposed penalties totaling $147,822. Read the news release for more information. Iowa OSHA issued Fink Electric, Inc. in Sioux City 15 citations and $159,798 in penalties for exposing workers to lead and asbestos hazards while removing asbestos- insulated piping. Inspectors concluded that the company failed to conduct required exposure assessments for asbestos and lead; train workers on respiratory hazards from lead and asbestos; and provide personal protective equipment for exposure to airborne asbestos fibers. Nevada OSHA issued three citations and $84,000 in penalties to Brady Linen Services, LLC in North Las Vegas for exposing workers to amputation and struck-by hazards from moving machinery. Inspectors discovered that the company had disabled safety switches on automatic towel folding machines. The company also failed to provide machine guarding on conveyor belts, exposing workers to caught-in and amputation hazards. OSHA ordered Orlando-based SIMCOM Training Centers to reinstate a flight instructor who was terminated for repeatedly raising safety concerns. In addition to reinstating the employee and clearing the personnel file, OSHA ordered the company to pay at least $301,882 in back wages, compensatory damages, and attorney fees, and to refrain from retaliating against the employee. For more information, read the news release. 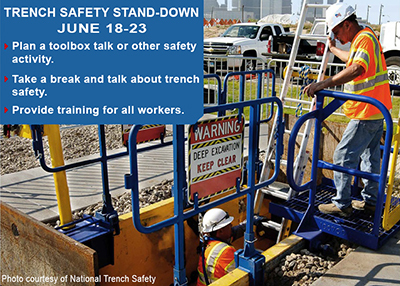 OSHA is joining the National Utility Contractor Association in a Trench Safety Stand-Down June 18-23. The week-long event will focus on trench and excavation hazards and reinforce the importance of using trench protective systems to keep workers safe. OSHA also recently partnered with the Ohio Bureau of Workers’ Compensation, Allied Construction Industries, and Turner Construction to host a trench safety workshop in Cincinnati. The workshop followed a recent fatal trench injury in Ohio, and aimed to help prevent future fatalities, particularly in smaller residential construction operations. 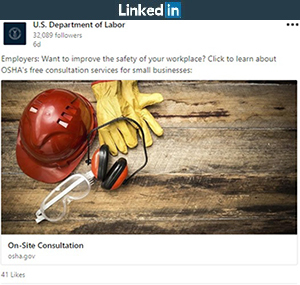 For more on protecting workers in trenches, see OSHA’s Trenching and Excavation webpage. National Forklift Safety Day, sponsored by the Industrial Truck Association (ITA), will be recognized on June 12 in Washington, D.C., and workplaces nationwide. Throughout the day, forklift manufacturers will highlight the safe use of forklifts, the importance of operator training, and the need for daily equipment checks. ITA works with OSHA through an Alliance to provide training seminars for OSHA inspectors, and develop safety materials. For these and other resources to share on National Forklift Safety Day, visit OSHA’s forklift webpage. 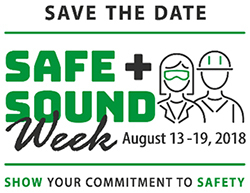 Safe + Sound Week 2018, a nationwide event to raise awareness and understanding of the value of workplace safety and health programs, will be held August 13-19. It is an opportunity for employers to show commitment to health and safety by launching or renewing efforts to identify and manage hazards before they cause injuries or illnesses. 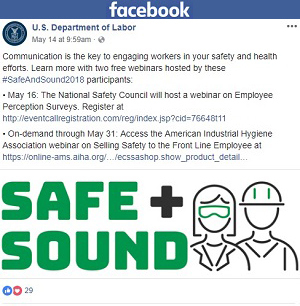 Visit the Safe + Sound Week webpage to register your organization as a participant and get ideas on how to recognize the week in your workplace. Join the June 26 webinar to learn more about Safe + Sound Week, the tools and resources available, and how to participate. OSHA was one of 24 organizations to participate in the Institute for Healthcare Improvement’s efforts to develop a national strategy for reducing hazards for healthcare workers. The agency joined the National Steering Committee for Patient Safety, which includes members from the healthcare, policy, regulatory, and advocacy communities. 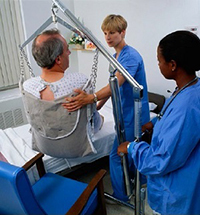 See OSHA’s healthcare page for resources on keeping workers safe. Representatives from more than 20 national alliances met at the May 3 Alliance Program Forum in Washington, D.C., to share resources that help employers protect workers. Deputy Assistant Secretary Loren Sweatt (seated, center) participated in the event and commended participants for helping OSHA reach nearly six million people on the agency’s enforcement, regulatory, and outreach initiatives. A beverage distributor in Mechanicville, N.Y., contacted OSHA’s free On-Site Consultation Program after experiencing high injury rates. DeCrescente Distributing Company immediately corrected hazards pointed out by the consultants, and instituted an inspection process for employees to regularly check equipment and report defects for prompt corrections. Employees were authorized to shut down operations to prevent exposure to serious hazards. These and other improvements in the company’s safety culture led to DeCrescente’s acceptance into OSHA’s Safety and Health Achievement Recognition Program. Since then, the company has lowered its recordable injury rate to half the industry average, which in turn lowered its workers’ compensation costs. For more information, read DeCrescente’s success story. OSHA has re-approved the Aclara worksite in Somersworth, N.H., for the agency’s Voluntary Protection Programs at the Star level. The facility, which manufactures commercial and residential smart meters that measure electricity usage, has demonstrated management commitment to reducing injuries and illnesses from musculoskeletal hazards. OSHA and Brandenburg Industrial Service Company entered a partnership agreement to protect workers during the demolition of a former federal complex in Kansas City, Mo. The partnership will identify common construction hazards such as falls, struck-by, caught-in, and electrocution; and encourage worker participation in safety and health programs. The Trenching and Excavation Alliance of North Dakota signed a two-year agreement to reduce the number of occupational exposures to physical and chemical hazards. Read the news release for more information. The Nebraska Workers’ Compensation Court and Consulate of Mexico in Omaha, Nebraska renewed a two-year agreement to provide workers in Nebraska and Iowa with information and training resources to help them understand worker protections under the Occupational Safety and Health Act. The Sheet Metal and Air Conditioning Contractors’ National Association Kansas City Chapter has signed a two-year agreement to protect workers from industry-specific hazards, including exposure to falls, electrocutions, amputations, and lacerations. For more information, read the news release.